Arlene Jones - Featured Columnist Austin Weekly News: Here Today....Gone Tomorrow! What Gives? On Sunday, Sept. 26, 2010, Frances Funches got a phone call. Her two-flat frame building at 1132 N. Parkside had caught fire. She was in the process of having the building rehabbed and only had electrical service hooked up. The fire was put out and Frances began the process of having her insurance company begin to adjust for the fire and the damage to the property. The property was secured and boarded up. The wrought-iron fencing in front would keep people off the property until the insurance company could fully appraise the damages. On Wednesday, Oct. 6, Frances stopped by the property to check on it and everything was in order. In fact, she was expecting the insurance adjuster to come by the next day. On Thursday Oct. 7, the adjuster did stop by the address. The adjuster then placed a call to Frances and asked her where the house was. Frances gave her the address but was shocked to learn that the house was no longer there. Somehow, an order had been signed within 11 days of the fire to have Frances' house totally demolished. In the past, Chicago was known as the "city that works." But when that city works so fast to take down a building on a block with numerous boarded-up houses, one has to question why Frances' building was deemed such an imminent danger over all the others. As I stood at the press conference held this past Monday evening in the empty lot where her house once stood, memories of Meigs Field came to mind. One night we all went to bed and had a wonderful little airport on the lake, and the next day it was destroyed. Frances had a house one day and a vacant piece of land the next. 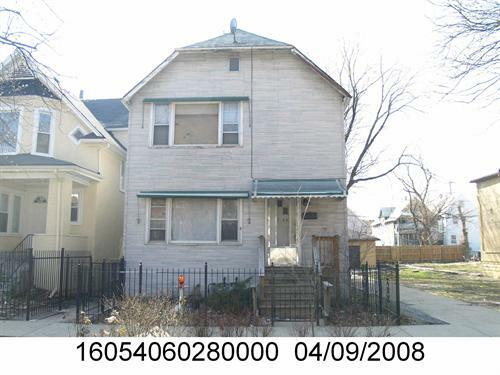 Even worse, the city wants Frances to pay $21,000 for the demolition. As I looked at pictures of Frances' house taken before and after the fire, one thing struck me as very interesting. If the next door neighbor's house to the south was barely singed by the fire, and the garage of the neighbor to the north wasn't touched by the fire, why did the demolition company tear down Frances' garage too? In the past, the city has torn down structures that were deemed too dangerous to remain standing after an incident. But if the fire were arson, wouldn't the building be considered a crime scene? I watched the television news report done later that night with interest. One reporter mentioned that the city response is that it has the right to take down dangerous structures. The Channel 2 news report also claimed that the city was unable to find the owner. But little ol' me did nothing more than put the address "1132 N. Parkside, Chicago" into Google and the first thing that popped up was BlockShopper. I clicked on it and scrolled down to the address for the property and the name F.W. Funches. But the city, with all its resources, ordered an immediate teardown of someone else's property and couldn't find the same information? Give me a break. In speaking with the owner, I also learned that all the wrought-iron fencing that once surrounded the front of the property is now missing, making me wonder if someone is getting a kickback from metal scavengers because it takes a lot of nerve to remove fencing facing the street on private property. What happened to Frances Funches should outrage every one of us living in this city. I didn't see a single elected official at the press conference and now must wonder what Ald. Deborah Graham, state Rep. Camille Lilly, state Senator Don Harmon, Cook County Commissioner Earlene Collins, and Congressman Danny K. Davis will do to sponsor a law to prevent such actions on the city's part against a private landowner.